Close your eyes of think of England. What do you see? For me, it’s castles, kings and queens, endless green lawns, double decker buses and centuries old buildings whose every stone whispers stories of victories and betrayals. I see our country’s ancestors who handed down to us their language, laws, and government and 21st century people who are our best friends in the world. 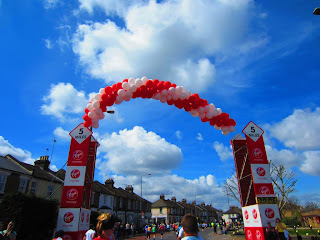 I had all of that and so much more at the London Marathon in April 2012. I started talking and couldn’t stop. I told him about the amazing organization of the marathon, from the best expo I had ever been to (so spacious, hundreds of booths from every possible marathon vendor you can imagine, an on site pasta party where the organizers had a constant stream of speakers and videos detailing what we would experience during the race) to the best organized race I had ever ran (although there were 36,672 finishers, I never felt crowded, there was water every mile as well as balloon arches and a dotted blue line showing us the fastest official route). I toasted two of my favorite writers, William Shakespeare and Charles Dickens, at the very pub where they used to hang out, the George Inn. I was so excited to be there, this was an English major’s dream field trip, that the bartender must have realized how cool this was for me and gave me my drink for free, and I don’t even like beer but I just had to drink to the Bard and Chuck! 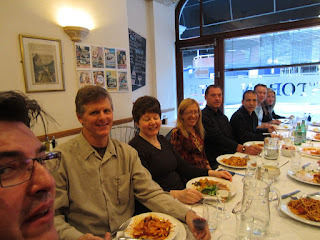 I traded running stories with 14 super friendly Canadians from our tour group, Marathon Tours and Travel, at the pasta dinner the night before the marathon. They are in a running camp so similar to our running camp, the major difference is that they run in freezing weather, including down to 20 degrees BELOW ZERO, something our Set Goals Not Limits campers have not experienced in Melbourne, Florida. The race itself was an experience of a lifetime, running through the outskirts of London in small rural villages, then into the city itself, with modern steel skyscrapers and historical stone buldings. 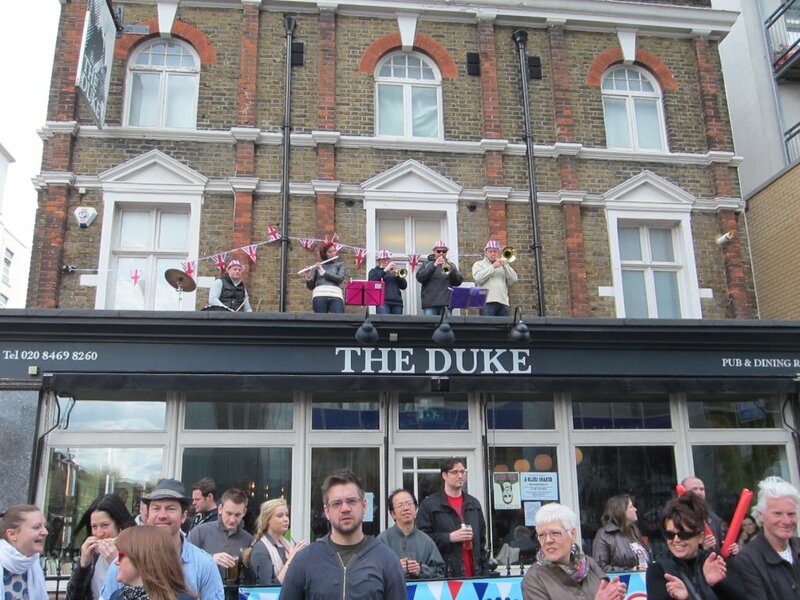 The spectators just made the race even better, screaming for us the entire way. “Go Florida” was something I heard often, as I ran in my Florida running shirt. And the other runners? 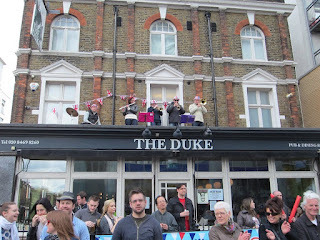 That was what was extra cool about London. It’s really 2 races in one. London is one of the 5 World Marathon Majors (this was race #4 for me, having already run NYC, Boston, and Berlin.) 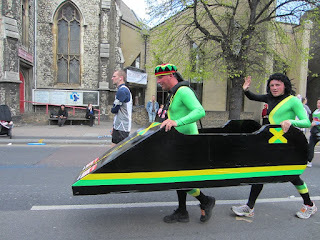 So it is A Serious Race, attracting the best runners in the world. The top 3 women finishers, Mary Keitany, Edna Kiplat, and Priscah Jeptoo, as well as the men’s race winner, Wilson Kipsang, have all been chosen to represent their home country, Kenya, in the 2012 Olympics. But this is a people’s race as well. Exactly half of all runners run for a charity, wearing the name of their charity on their shirts. It’s hard not to cry when you see some of the names of the charities, such as Kids with Cancer and Stillborn Babies Charity. Most of these runners are not super fast. The organizers of the marathon keep the race going for 8 and ½ hours, whereas most marathons are open for only 6 hours. 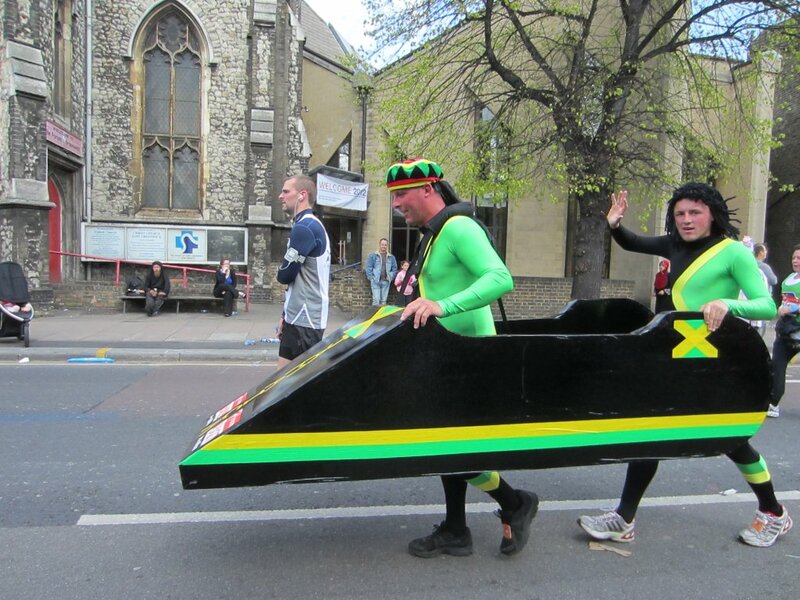 And that’s not just for the charity runners – there is also something unique about London’s marathon – it’s the huge number of runners in “fancy dress”, meaning crazy costumes. There’s even a corral at the start for these runners, wearing everything from formal evening wear (while dining) to a running car to animal costumes to Wizard of Oz characters to a raunchy workman (naked except for his tool chest, which did not cover much of his body) to another guy naked except for a teapot (which pretty much covered his whole body). 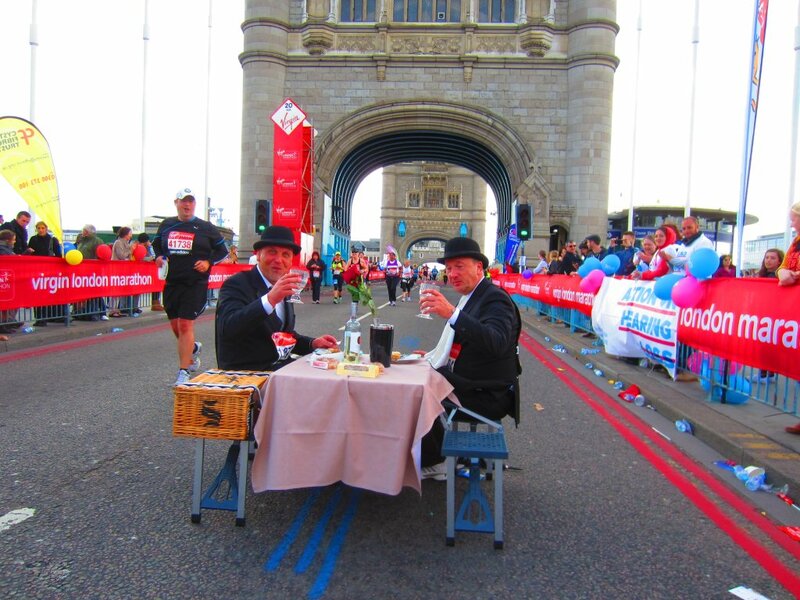 The juxtaposition of running by some of the world’s most beautiful sights: Tower Bridge at mile 12, Big Ben and Westminster Abbey at mile 25, then finishing the race right in front of Buckingham Palace, while running by these “fancy dress” runners is one of the craziest things I’ve ever done. “Were you always a runner?” the driver asked me. I briefly told him my story (it’s detailed in my Boston Marathon blog), basically, started running at age 45, started training for a marathon in the hospital after getting really sick at age 48 (as in walking the halls in a hospital gown, tied to an IV pole, deciding I was no longer the girl in the bed but a runner training for a marathon even though I had never run a race farther than 3.1 miles) and that if I can do this thing, run marathons, anyone can do it and more… I encouraged him to get out and run, and he said he’d give it a try! When we pulled up to my hotel he said he wanted a picture of me, and I emailed him my post race picture. I opened my wallet and he refused to take a penny (or shilling or pence or whatever they call their coins, I never got that straight, I just concentrated on the paper money) and said it was an honor for him to have me in the cab. 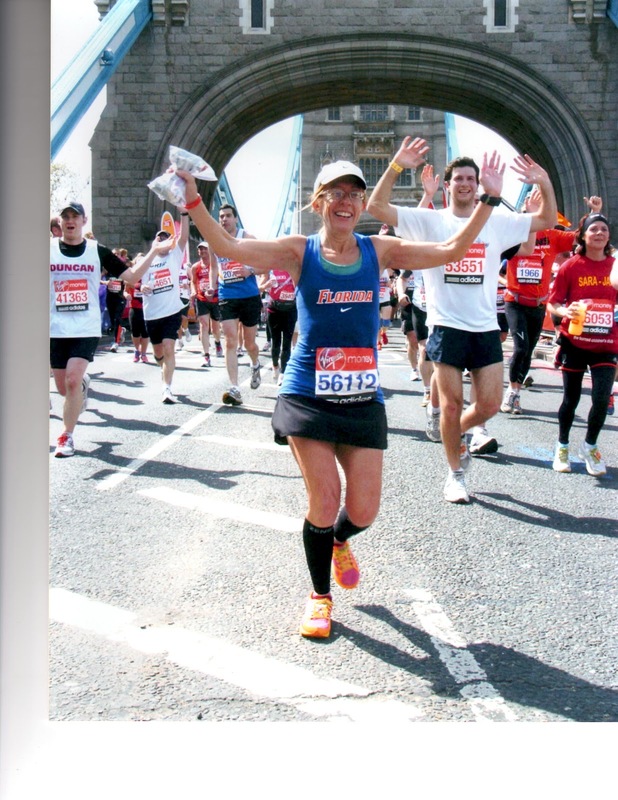 All the English people I spoke to that marathon weekend treated me like my cab driver did, like I was something special, like they were proud to have an American come to their country to run their marathon. Everyone wanted to know my story, was I a professional, did someone sponsor me to race London (they were asking this of ME!) 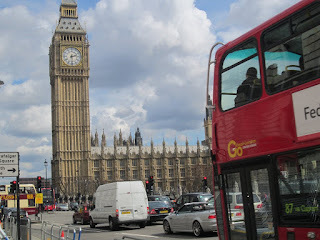 and what did I like about London. Easy to see why these people are our country’s best friends. The next morning, before leaving for the airport, I sat at breakfast at our hotel’s restaurant, and I hear, “There’s Cindy Bishop from Merritt Island!” Philippe joined me at our table. Philippe, another Canadian with our group, was someone who I ran Berlin with in October 2011. He is on my schedule, running all the World Marathon Majors. I’ll see him in Chicago in October. We talked about the marathon non stop for half an hour. We were both happy with our times: I ran my second fastest marathon in 4 hours, 18 minutes, and 5 seconds. Philippe ran a PR in 2 hours and 42 minutes and 6 seconds - and he’s 47 years old!!! 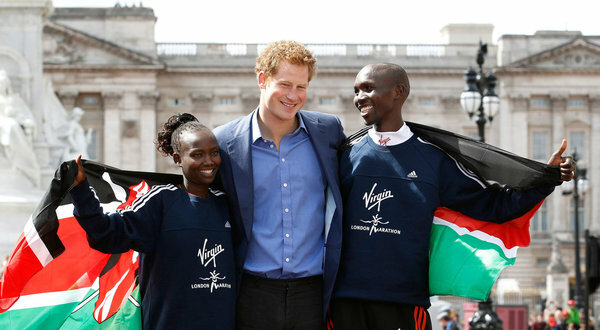 We spoke of how crazy cool the fancy dress runners were, how great the organization was and how the spectators just kept us going… I mentioned that it was cool that Prince Harry gave out the awards, and another kind of royalty, the future Kenyan Olympic team, can someday tell their grandchildren that they ran the London Marathon with Cindy Bishop. But we both agreed that the real royalty was the most inspirational runner of all, the one we can tell our grandchildren about, and anyone else who will listen. Philippe and I, and the other 36,669 finishers, ran with Fauja Singh, a 101 year old runner who finished the marathon in 7 hours, 49 minutes, and 21 seconds. He didn’t even start running marathons until he was 89 years old. Fauja proved to all of us that we can do anything, defy the odds, if we just follow our dreams.